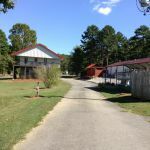 Ask fellow campers about "Golden Pond RV Park" and nearby attractions. We stayed here in Nov. While we was getting our property ready to move on. The owners of this campground are super nice. The campground is also in great shape. We would definitely stay here again! We camped at Golden Pond RV Park in a Fifth Wheel. Rate reflects average of PA and veteran discounts for our length of stay. Only 2 negatives are the large gravel rocks at the site and no fenced dog run. Both my wife and I tweaked our ankles on the big gravel. Not a really big deal, just something to be aware of. Sites are "buddy" sites, but if you aren't traveling with a buddy, you don't get one. Instead you get both sites, making one big site. First thing I noticed when I drove into the site was the very nice looking picnic table. Had a lovely stained finish, coated with urethane. No fire ring, but I'm sure I would have gotten one if I had asked. Plenty of places to walk the dog, but I like letting them run off leash so they can tire themselves out more easily. Owner came around to warn us of potential bad weather coming and told us where to go if we wanted to hunker down in a block structure instead of the RV. Luckily the storms weren't as bad as predicted, but the warning was a nice touch. Quiet short-term sites away from the road. WiFi worked well in the RV. Easy to get a sat signal. Good water pressure and no issues with connecting, especially since you have the option of connecting to one of 2 places (buddy sites). Not much in the town of Shirley. Gas station, car wash, one cafe. Closest town of size is Clinton, about 15 miles (20+ minutes) away. Great motorcycling roads here (twisty and hilly). Would definitely stay here again if in the area. We camped at Golden Pond RV Park in a Fifth Wheel. This is a hard review to write. The young couple that own this park...and their three girls, are such nice people. And they have received very HIGH reviews for sure. I'll be honest. I don't know where these "lofty" reviews came from! Frankly, It appears the owners have bit off a bit more than they can chew. First, the restrooms are in need of a complete makeover...and they were not up to what I call an acceptable standard. They were in need of a complete scrubbing and walls and floor are in need of a complete paint job. There is no insulation in the ceiling of the restrooms and from children playing to dog running it is quite noisy. The RV sites are in need of cleanup as is the interior road around the pull thru section. The sites just are not groomed and the site base, along with the road, is made up of stone of all size and shapes making it difficult to walk in daylite hours, not to mention problems walking at nite. Sorry, but this "away from the lake" Park is not worth more than a four until major work is done on bath house, sites and interior roads! We camped at Gokden Pond in a motorhome w/toad. We would not camp here again! We camped at Golden Pond RV Park in a Motorhome. It has taken me over a week to respond to this review due to being shocked. First off if you camped here in September our bathrooms were repainted, tiled and renovated with new cabinets at the end of June this year. They are cleaned 4 times a week and given a once over every morning since some don't like to flush. We are a family owned and operated park that strive to give the best camping experience we can possibly give. Yes we are rebuilding the pull thrus. Building them up to perfect level so we can pave them in something really nice. I'm sorry you could hear our kids above the bathrooms. The dog you heard was one of our campers dog that we were watching because they were in the hospital having hip replacement surgery. I'm personally building a new house and cabins on the back side of our property. I'm sorry you didn't like your stay here at Golden Pond, but many really love it here and insulting their reviews is quit rude. We wish you all the best in the world and safe travels. 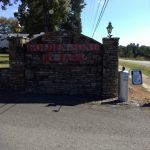 We found this great rv park by word of mouth. The park is secluded, but conviently located, in a spot of exceptional beauty. We heard about the beautiful lake and wanted to camp close to it. Our family also wanted some amenities like a hot tub, pool and nice clean showers. I wanted to have fire wood and fire pits for our evening family gathering. This park has it all. Plus the 30 foot pool has plenty of deck for my daughter in laws sunbathing. There is a nice food store and the handy "dollar general"within 2 miles of the camp. Greers Ferry Lake Marina is not more than 4 miles from Golden Pond RV park. It offers tours for mountain hikers, fishing boats to rent, jet skis, and pontoon boats. Tubes for water fun and about any other equipment a a person might need to enjoy this remarkable, scenic lake area. Now, after my family and I enjoy a perfect day on the water, we came home to Golden Pond RV Park, to find the delicious BBQ Chow hut parked right there on the edge of the rv park. We took advantage and ordered, what can only be discribed as top shelf, pork or chicken bbq sandwiches plates with home made sauce and your choice of potato salad, baked beans or green beans. yummm. We so enjoyed the couple who now own this park. They are both very hard working. They welcomed my whole family and couldn't have been more accommodating. The park is very well maintained and every person we met there was friendly, fun and interested in making our stay enjoyable. My grandkids loved fishing in the pond and kept every fish they caught. The activity room has full kitchen and lots of games available. The tv in the activity room is very large and husband enjoyed watching the sports events he thought he'd have to miss. Will we stay here again? Absolutely! Family has already made reservation for a whole week of fun next year. We camped at Golden Pond RV Park in a Fifth Wheel. Things not to miss includes Mountain View, the town boasts folk music, handmade treasures, and antiques. Good food and fudge are plentiful. The natural bridge just outside the little town of Clinton. Fairfield bay area has golf, reaturants, shops of souvenirs and Indian Caves. Blancher's Caves are remarkable and all these places are about 25 or 30 miles from Golden Pond RV park. Best camp ground in the area for sure! The owner greeted us and showed us to our huge pull through space. You get two spaces for the price of one. They are gravel but are just perfect. Saw a previous review and couldn't be further from the truth. Must be a stick in the mud because the park is very clean with a ton of amenities. Great Wifi. We loved the Hot Tub and he just put in a new pool that the kids loved! We went fishing and we caught dinner. We will be coming back every summer for sure. Stayed here in a 43' motor home. We camped at Golden Pond RV Park in a Motorhome. Didn't have to disconnect tow vehicle. Groceries are at cravens 3 miles down the road and if you like lake life it's 3.5 miles away as well. Best campground in the Ozarks! Fairly easy access for a big rig. Pull thru Sites are long and the surface is very large gravel and while good for parking, is hard to walk on. Several long term residents, and a couple of them are kinda junky and makes the rest of the park look bad. Electric is solid and the wifi actually works! They have cable with several stations but the picture quality is not good. I hooked up my satellite after one night. New owners are working on things and one day will get there, but right now it is a work in progress. Having said that,it is the best place to stay in this area. We camped at Golden Pond RV Park in a Motorhome. Best place to stay in Fairfield Bay. Stayed here for a week over Labor Day for family get-together. Since all the family is in and around Greer's Ferry it was perfect for us. The owners are a very nice young family who bought the park fairly recently and they take a lot of pride in it. They are constantly upgrading the facilities so it is getting better every day. All hookups were fine (water pressure was about 65 psi). I said I was in site D1 and D2. They gave me the site next to mine for free so I wouldn't have a close neighbor! The only thing that keeps it from being even better is the one thing out of their control. It's that the park is a little remote, it's about a 25 minute drive to Clinton for supplies. Last thing is DO NOT rely on GPS. it will route you south on 16 and it is a narrow, twisty, hilly road. There is an alternate that is WAY better - call for directions. I would stay here again in a heartbeat. We camped at Golden Pond RV Park in a Motorhome. There is a small grocery store called Craven's a few miles down Hwy 16 towards Greer's Ferry that has really excellent quality meats. I bought a prime rib roast and a porterhouse and they were excellent. The park is nothing special, just a place to set up your RV. The sites are very close to each other, this could be uncomfortable if the park were fully occupied. The management tries to leave a site vacant between each RV. The interior roads are paved, the sites are grass, no dust. The park is fine if you are there just to enjoy the surrounding area, which is very pretty. Full Hook Up, 50 amp, sewer, water and a small laundry facility. As far as a town goes there really is not much of one to mention. Larger town, Clinton, 15 miles away. We would stay again. We camped at Golden Pond RV Park in a Motorhome. Very little in the town of Shirley, if anything. Clinton, the town 15 miles away has everything that you would expect to find in a large town. We paid $5 so we could have 50 amp service. This park is a gem! The owner came out and greeted us and we were led to our spot. They had just put down crushed rock at the site, so walking was harder for us "older" folks. It is very quiet and we had a pull-through spot. They sell propane here. They are developing 30 more sites that will be open the summer of 2016. There is a BBQ wagon at the driveway entrance. They also have a fishing pond that is stocked and you can keep your catch. We would stay here again. We camped at Golden Pond RV Park in a Fifth Wheel. A little too remote for my wife's, taste hence the 8, but a wonderful little park. Very quiet and neighbors are friendly. New owners did everything possible to make our stay enjoyable. If I find the need to be back in this part of Arkansas again, I will be staying here. We camped at Golden Pond RV Park in a Fifth Wheel. Stayed for three nights in this is very friendly park! The owner came out of the office and greeted us before we even had the MH turned off. He showed us a couple of sites and let us choose which one we wanted. The park is located close to many activities and is very quite at night! New WiFi just installed and is the best that we have experienced in our travels. We will back! The price reflects our Coast To Coast Premier cost. We camped at Golden Pond RV Park in a Motorhome. I’ve never gave any park reviews before but I couldn’t pass this one up. A must visit park, quiet, clean and very friendly. The park has new owners and they are doing more than expected to make your stay unforgettable. They have big plans to make this park enjoyable for everyone. Sites are large and most are shaded. 30 and 50 amp service, Wi-Fi works good, water pressure is good, cable is a little fuzzy on some days but other days it is good. All sites are full hook up. Large pond on site with plenty of fish. There is a nice large community room with TV, books to read and plenty of tables to gather around. There is also a covered patio with tables and chairs to gather around with friends and enjoy the night air. Mail service is also available. Only 2 miles to the grocery store and 16 miles to the Walmart supercenter. Medical center, Hospital and eye clinic just down the road from Walmart. Plenty to see and do not far from the park. Natural Bridge, Blanchard Caves and Greers Ferry Lake are close places to visit also. We camped at Golden Pond RV Park in a Motorhome. This park is a gem as it is quiet with large spaces and lots of pull through spots. There is a club house and the people that run the park are helpful and friendly. This is the price for RPI and if you stay there as Passport America it is $13 and no limit to the days. We will stay here again and pass it along to others. We camped at Golden Pond RV Park in a Fifth Wheel. Very friendly and helpful owners. Reasonable Wi-Fi, nice pull through sites. Very quiet and excellent for one or two nights (or longer if you like fishing!) We stayed here with PPA. We will come back. We camped at Golden Pond RV Park in a Fifth Wheel. A great stop for passing through. Rustic bathrooms but clean. Bathrooms had 2 showers and 3 stalls. Pressure was good and water was hot. Cable TV was fuzzy. Wifi was good for checking email (probably sat). We camped at Golden Pond RV Park in a Motorhome. Are you affiliated with Golden Pond RV Park ?